Createspace Independent Publishing Platform, 9781976507915, 266pp. 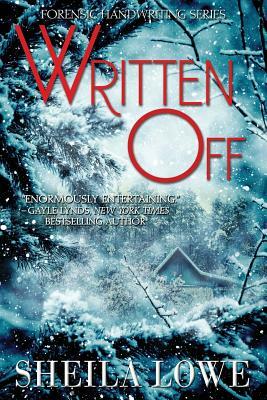 In the dead of winter, handwriting expert Claudia Rose flies to Maine to interview convicted serial killer, Roxanne Becker. There, she is exposed to a shocking secret about a group of grad students dubbed "Maynard's Maniacs." Was Professor Maynard-herself brutally murdered-conducting research that turned deadly? Swept up in the mystery of Madeleine's life and death, Claudia soon realizes that the professor left behind more questions than answers, and no shortage of suspects. After the police chief persuades her to inspect a newly produced, handwritten will, an impending blizzard forces Claudia to seek refuge in the professor's isolated house. There, she becomes trapped with a killer. "A simply riveting read from cover to cover, 'Written Off' by Sheila Lowe is an impressively entertaining and deftly crafted novel of suspense from a novelist with a complete mastery of the genre and a genuine flair for originality." -Midwest Book Review. Like her fictional character Claudia Rose in the award-winning Forensic Handwriting Mysteries series, Sheila Lowe is a real-life forensic handwriting expert. She holds a Master of Science degree in psychology and has taught forensic handwriting examination at the University of California Riverside Campus in the CSI Certificate program and at the University of California Santa Barbara Campus in the Discovery program. She's also the author of the internationally acclaimed "The Complete Idiot's Guide to Handwriting Analysis" and "Handwriting of the Famous & Infamous," as well as the Handwriting Analyzer software. Sheila's analyses of celebrity handwritings are often seen in the media. Connect with Sheila Lowe at www.claudiaroseseries.com or www.sheilalowe.com.